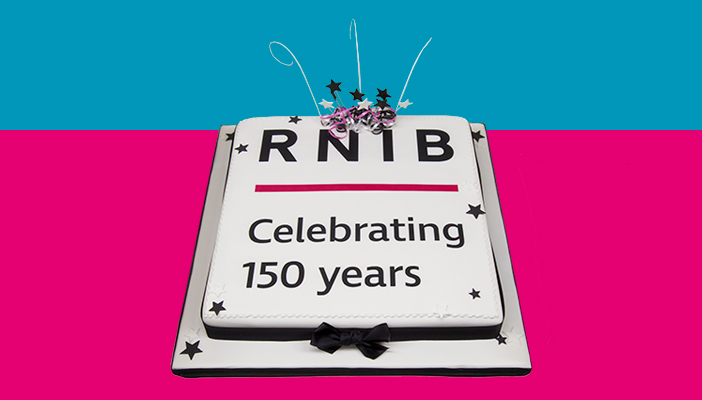 As we celebrate our 150th anniversary today, celebrities, authors and blind and partially sighted people have sent us some lovely birthday messages. Comedian and presenter, Stephen Fry, said via Twitter that he was "proud" to be supporting RNIB and directed his followers to one of our latest videos featuring children talking about their hopes for the future. He added: "Let’s see the person, not the sight loss. Watch this inspiring and heart-warming video of bright young minds of tomorrow,"
Actor, Brian Blessed, is encouraging his followers to take a look at our history. Elizabeth Proud who has been a reader of Talking Books for over 52 years took the time to wish us "a very, very happy 150th anniversary". Anne Hornsby, Director of Mind's Eye thanked us for all our help in reaching blind and partially sighted audiences by increasing awarenessd of audio description. Congratulating us our milestone, Tom Wright, Chief Executive at Guide Dogs, said we are an organisation with a proud history of supporting people with sight loss. He added that he looked forward to "our organisations working closely together for many years to come. Maker of Prince Harry ahd Meghan Markle's wedding cake, Claire Ptak and her team kindly donated cakes to our staff to celebrate our birthday.. She said: "We are delighted to be supporting RNIB's 150th Anniversary. We loved making and donating cupcakes for their big day! Well done to everyone at RNIB for your inspiring work in making a difference to the lives of people with sight loss. Listen to more of our birthday messages from authors, blind and partially sighted people and much more.